Office Space - Gurnee, Illinois. This exquisitely furnished and exceptional quality professional business center location provides an extensive and state of the art range of facilities and on-site services including specialist administrative support, private office suites and dedicated conference rooms with technical equipment as standard. 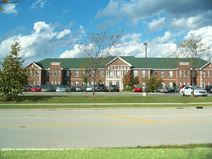 The building is located near a major intersection at Illinois 294 making it commutable from Illinois and Wisconsin.